Dr. Matthew F Kamil, MD is a Doctor primarily located in Rochester, NH. He has 21 years of experience. His specialties include Endocrinology, Diabetes and Metabolism and Internal Medicine. He speaks English. Dr. Kamil has received 3 awards. The overall average patient rating of Dr. Matthew F Kamil is Great. Dr. Matthew F Kamil has been rated by 17 patients. From those 17 patients 5 of those left a comment along with their rating. The overall rating for Dr. Matthew F Kamil is 4.0 of 5.0 stars. I feel he is terrible did not have good experience there find a different doctor to go to I went in for biopsy of my thyroid and he did not use anything to numb the area before he started when I left I had tears streaming down my face it hurt so bad. I was very happy with my visit with Dr.Kamil. His office gets you in and out quickly. He knows how to get your blood sugars down and under control. The support staff is also really nice and helpful. Would recommend. I was seen by Dr Kamil, referral for hypothroidism. I was treated very poorly and made to feel it was all in my head. I was asked if I was in Chernyobal at the age of 1...really? I was then told that "if I wanted to make a big deal about this I could do an ultrasound." What should I have said to that? Yes please make a big deal. I was mocked for being on weight watchers, and told that he is used to seeing pts 250lbs. Do not go to him if your concerned with hypothroidism and undiagnosed previously. I thought that he took his time and review my records and knew just what to do. Dr. Kamil listen to me and was very helpful. He explains things so I could understand them. I would recommend him to my friends and family. The nurse Pattie was so nice and down to earth . I could relate to her. Good experience. Wonderful doctor, would absolutely recommend. Take a minute to learn about Dr. Matthew F Kamil, MD - Endocrinology, Diabetes and Metabolism in Rochester, NH, in this video. Dr. Matthew F Kamil is similar to the following 4 Doctors near Rochester, NH. 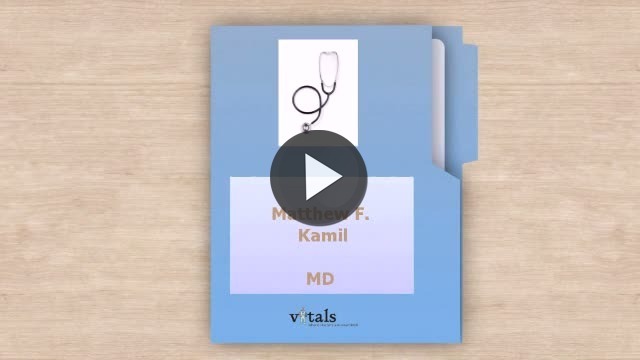 Have you had a recent visit with Dr. Matthew F Kamil? Select a star to let us know how it was.